One of the top requests we get from our clients – whether they are remodeling their current home or have recently moved into an older house – is to have the popcorn ceilings removed. These textured ceilings — also known as popcorn ceilings, acoustic ceilings or even cottage cheese ceilings (gross!) — were very popular in the 1970s and ’80s, but have since become a less-than-favorable feature. Not only do these ceiling’s uneven surfaces catch more dust and allow for cobwebs, but they really make a home’s interior look stale and dated. The first step prior to removing a textured ceiling should always be to test it for asbestos. This substance was often used in homes built prior to 1980, but was banned after it was found to cause lung disease and cancer. Scraping a ceiling that contains this substance could be very dangerous for your health! To find out if your popcorn ceiling contains asbestos, scrape a small sample from the corner of your ceiling and send it to an accredited lab for asbestos testing. You can also pick up a home test kit from a home improvement store. If the test is positive for asbestos, contact a company that specializes in asbestos removal. Do not attempt to remove the asbestos yourself! Even if your home was built after 1980, it’s still a good idea to have a sample tested. Building materials containing asbestos continued to be used until the late 1980s in disregard of the new regulations. 1. 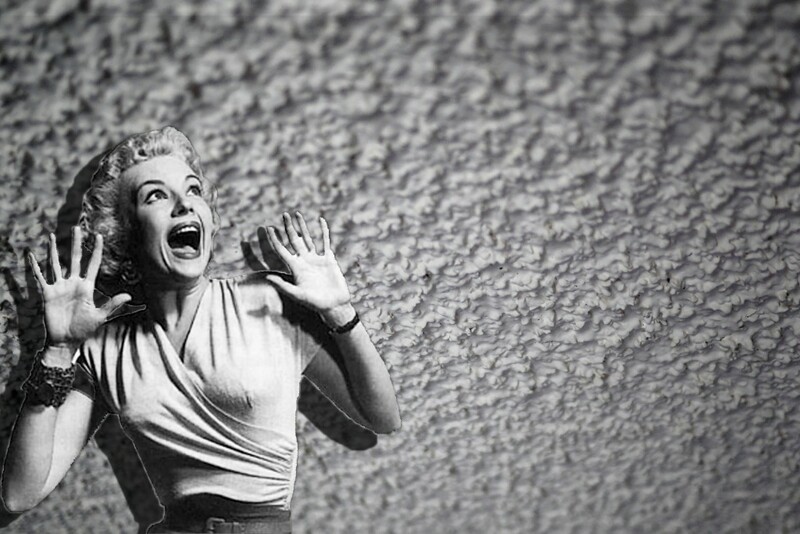 Scrape popcorn ceilings yourself. A brave homeowner can remove popcorn ceilings themselves with the help of a spray bottle, a sturdy scraper and plastic floor coverings. This is the least expensive option, as far as the tools go, but this DIY project takes a lot of time, effort and hard work! Not to mention the mess you’ll have to clean up after scraping. Once the texture has been removed, you will have to mud over most of the ceiling or do plenty of sanding if you want it to be smooth. So be sure to factor in these hidden costs if you choose to take down your popcorn ceiling yourself. 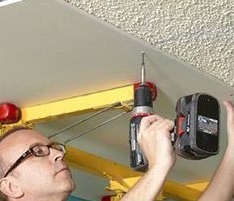 A cleaner, somewhat easier alternative to scraping the popcorn ceiling is hanging drywall over it. You’ll need to use a stud finder to make sure you know where the joists are, and then you can use lightweight drywall and extra-long screws to get through the original ceiling to the joists. You will also have to do the finishing work of taping, mudding and sanding the drywall to prepare it for paint. Any crown moulding or fixtures in the ceiling will need to be removed and reinstalled after the new drywall is in place. 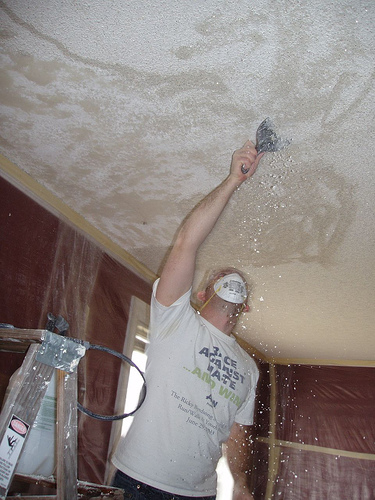 The safest and cleanest option to remove popcorn ceilings is to hire a reputable contractor (like Medford Remodeling!) instead of doing it yourself. Hiring a drywall professional, handyman or remodeler is essential if asbestos is a factor, and it will also result in the smoothest, best-looking result! 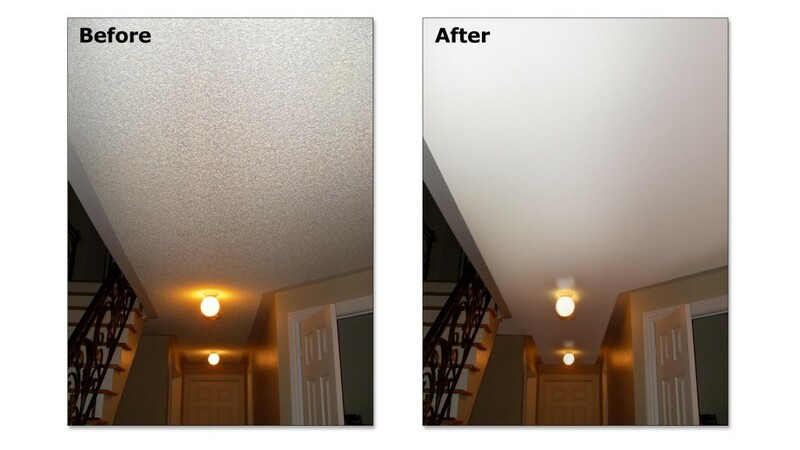 If you’re ready to remove your home’s popcorn ceiling and reveal a sleeker, more modern look, there are several ways to get the job done. Of course, you can always contact us if you have additional questions or need help with the project!